The Ea By-Pass Oil Filter (EaBP) provides the best possible filtration protection against wear and oil degradation. Working in conjunction with the engineï¿½s full-flow oil filter, the AMSOIL Ea By-Pass Filter operates by filtering oil on a ï¿½partial-flowï¿½ basis. Offers easily accessible remote mounting capability for a full-flow spin-on oil filter and a spin-on by-pass oil filter for marine applications. Must purchase separately the spin on adapter that matches the engine's filter thread. Engine wear is caused by dirt particles of about 5 microns. By-pass filtration removes particles less than one micron or larger, virtually eliminating engine wear. Filters all of the oil in a 6 quart system in about 5 minutes. Without bypass filter element - 1 required. For use with EaBP90, EaBP100 or EaBP110 Element. Links two AMSOIL By-Pass Filter Elements together for engines with sump capacities greater than 20 quarts. Includes Flow Restrictor without hardware, hoses or filter elements - 2 required. For use with EaBP90, EaBP100 or EaBP110 Element. 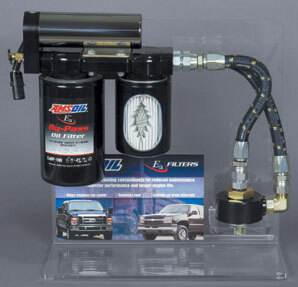 Combines Full-Flow and By-Pass filtration on a single, easy-to-install mount. All installation parts except filter spin-on adapter are included. Must purchase the spin on adapter that matches the filter thread on your vehicle. Without filter elements - 2 required. For use with EaBP90, EaBP100 or EaBP110 Element. Spin-on Adapter BP402M is designed for 2008-Present Chevrolet 1500 & 2500 gas engines. For Ford 7.3L PowerStroke applications. Includes both filters and spin-on adapter. For GM & Duramax 6.6 liter applications. Includes both filters and spin-on adapter. For heavy-duty by-pass applications. Featuring the same synthetic nanofiber media as the rest of the Ea By-Pass Filter family. 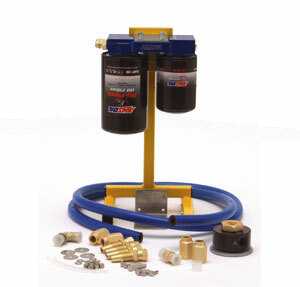 Filter and hose not included with the BMK30 kit. The EaBP120 Filter and hose (BP250) must be purchased separately. 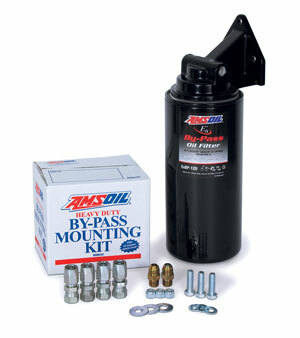 Designed for use with the AMSOIL Heavy-Duty By-Pass Filtration System (BMK30). Installs directly onto the BMK30 mount and includes the Deluxe Oil Sampling Valve (G1570), providing samples at the push of a button. Copyright Â© 2006 - 2017 Fisher Resource Solutions ® All rights reserved.